A true captains performance, and a bonus point! The Dr.Wheatgrass highlight of the day goes to Takady’s 6 over cover! In a situation that we struggled to get a team to play, few sharks made a great contribution of making themselves available. Massive thanks to those guys including the debutant Joshi! So we (the selectors) did manage to get a team of eleven to play against the Wyverns and even got a 12th man Neel! Thanks mate absolute legend! Our morning did not kick off in the coolest fashion as our skipper left his kit bag at home, and stand in skipper Takady lost the toss. 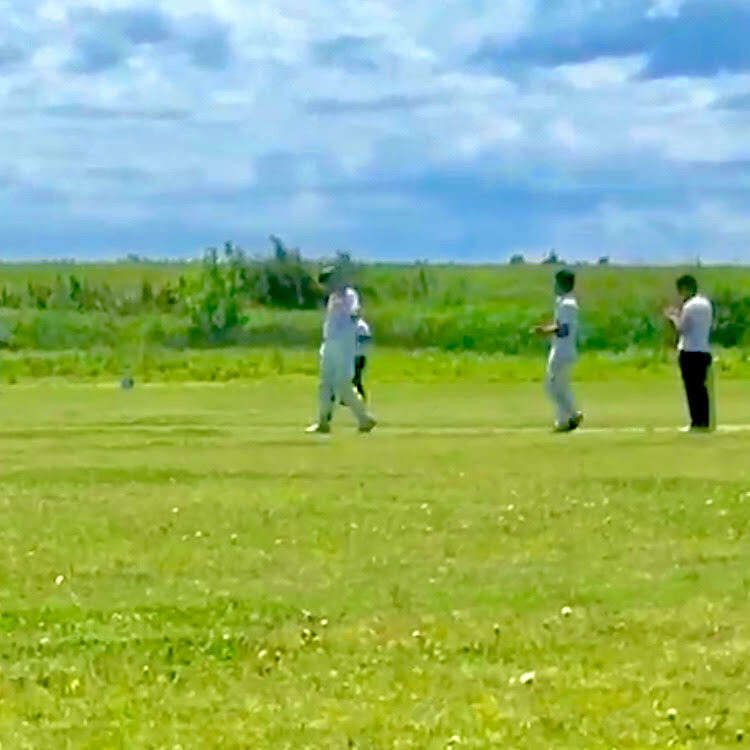 But our Saturday morning started to become a good one as the Wyverns captain Ota somehow sent us into bat, in what were some of the finest batting conditions we’ve seen. Clampa led the warmup in Jamaican style and our opening pair Doogs and Sanjay walked out to the middle. Our innings didn’t started perfectly as Sanjay gave the Wyverns slips some catching practice after putting on 4 for himself, and 6 for the team, but from then on the game was all in our hands. Captain Doogs and the rock solid Jamaican recruit Clampa (Davian Johnson) built a partnership of 65 that was very easy on the eyes, with Doogs bringing up yet another 50 which Ritchie Benaud would have described as “absolutely marvellous “. But when Clampa (14) fell he followed soon after, getting yorked by a ball that bounced half way down the pitch for a very well made 52. 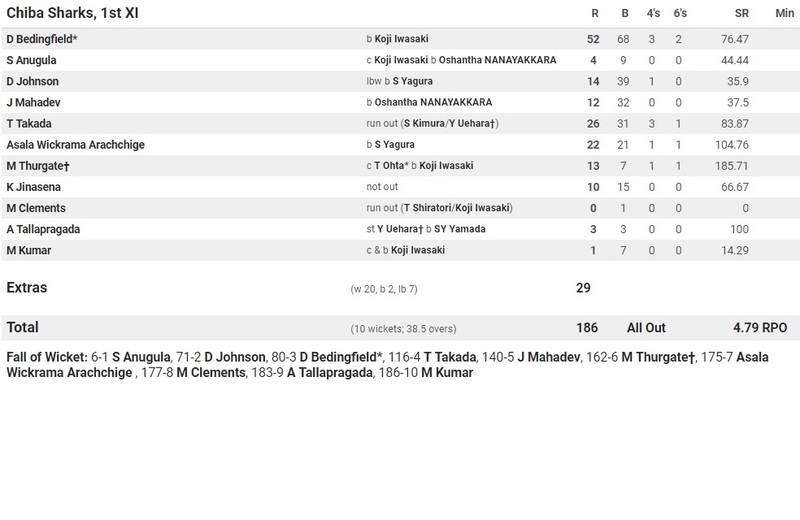 At times like these we usually start our famous collapse, but it was not to be today as the man who found himself in form, Takady (26), and debutant Joshi (12) hung in for a 36 run stand. Out of nowhere, Takady found himself in a horrendous mixup and got run out. That brought Asala to the crease with some valuable runs, sending his second ball of the innings over the rope for a maximum score. When Joshi (22) went, Marcus who enjoyed his 9th consecutive weekend in Sano came and went for a quick fire 13, and that infamous sharks reared its head as the tailend struggled to put the runs on the board. In the end the Sharks were all out after 38.5 overs for 186 which is never the greatest amount of score to chase down . . . but the Wyverns side struggled to put some early runs on the board as sharks got off to a perfect start with the ball. It was the off spinner Takady who took the ball and the wicket of the former professional baseball player Kimura, gone for a golden duck, thanks to Adit combining some juggling skills with Max down at 3rd man. The slog sweep was definitely not the right option for his 1st ball as we gave him a lot to think of. At this stage, it was 1-1. At the other end Adit was causing a lot of trouble with his hooping inswinger (left arm too if you don’t mind), not letting the Wyverns top order getting into their stride. But the 2nd breakthrough was off our mystery man Mahesh, taking the top edge of Japanese national side’s vice captain Ota, comfortably caught by Neel (12th man) running in from somewhere deep (to this day we have no idea where he came from). 2-18. Soon it was 3-22 as Yoshi Uehara’s nightmare against the sharks continued as he was dismissed for yet another duck finding Doogs in slips, and guess who, it was the mystery man Mahesh striking for the 2nd time for the day. Next wicket was down when Max found the edge of experienced national side player Raheel Kano, in to the hands of Doogs, always safe as houses at 1st slip. 4-33. Some resistance was to follow, when the Wyverns no. 3, Shiratori (top scored 35), and Buddhika (24), combined for 37 runs which was their highest partnership for the day. Clamps then took a smart catch off his own bowling when Shiratori hit one like a tracer bullet. 5-70. Fortunately for us, the Wyverns tail collapsed when Buddhika was clean bowled by Adit’s slower ball, who found himself on hat trick when he dismissed Shodai the ball after. Unfortunately he left the hat trick for next time, ending his spell of 2-15 off 7 overs (Econ 2.1) which was easily the spell of the day. KJ joined the festivities and came on to take a wicket. Even Takady’s worst ball of the day turned into a wicket, and it was Max taking a good low catch (without a juggle this time) off Clampa’s bowling to wrap up the day. Sharks bowled the Wyverns all out for 99 in 31 overs as we found ourselves a BONUS POINT WIN! P.S, Doogs needs a new bat, any recommendations?